This tomato salad is wonderful. Only 3 ingredients and you have a flavorful refreshing summer salad. It can be served as a side dish or as a salad. Happy Saturday, friends! Hope you have a wonderful weekend! If you are wondering what to cook today, I have a solution for you. This tomato salad takes no more than 5-10 minutes to make and goes wonderfully with any meal. Today, I am going to share with you a simple tomato salad which is one of my go to salads. Have I mentioned that I LOVE tomatoes? They are so juicy and flavorful. I can probably eat a whole bowl of tomato salad all by myself. I can’t wait for our tomatoes in the garden to ripen. We already have several green tomatoes (and they are getting pretty big) but are still green. I have been checking on them almost every day because I just can’t wait to eat tomatoes from our garden. Have you noticed how much tastier homegrown or farmer’s market tomatoes taste? It must be because they are grown with lots of love and care. 😉 And no pesticides. 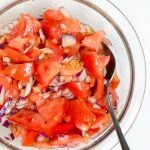 So, for this super simple and super delicious tomato salad, you will need only 3 simple ingredients. Yes, only three. Basically, you don’t have any excuse not to make this salad. 🙂 Tomatoes, red onion, and garlic. I don’t count here olive oil and salt, as they are very basic ingredients. But even if you do, you still have a salad with 5 ingredients. It doesn’t get easier than that. You can serve it as a normal salad course, or side dish to almost any meal. I like to serve it with grilled chicken or baked tilapia. Hope you enjoy it! 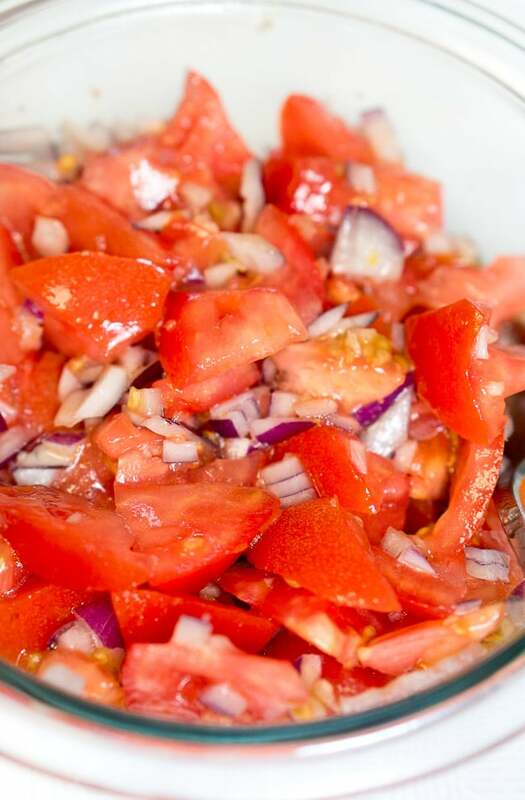 In a medium salad bowl, combine diced tomatoes, red onion, and minced garlic. Season with salt to taste and add about 4 – 5 Tbsp olive oil. If you wish, you can garnish the tomato salad with freshly chopped parsley. 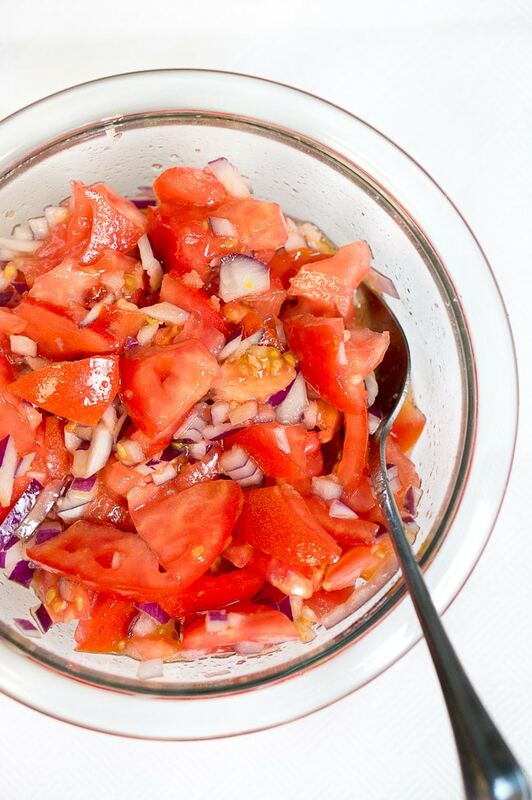 In a medium salad bowl, combine diced tomatoes, red onion, and minced garlic. Season with salt to taste and add about 4 - 5 Tbsp olive oil. We have wonderful tomatoes here in Italy, so of course we eat lots of tomato salad. I love the addition of onions and garlic. Makes it so flavourful! I finally have a house where I can plant tomatoes and I ma so excited to finally get some fresh tomatoes. This is a great way to serve them! Oh, the dish is beautiful! It made me realize my absolute need for tomatoes. 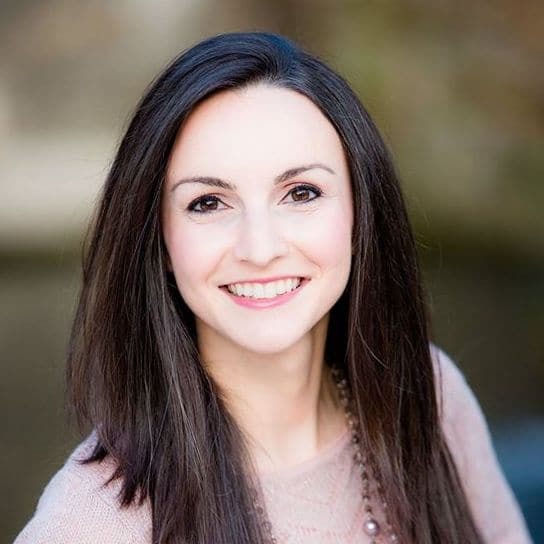 Beauty in simplicity.Your photo is absolutely beautiful!!! I love the bold flavor this adds to dinner in such an easy dish to get on the table! Love it! What a gorgeous, summery salad – such a simple combination of lovely ingredients, always the best sort of salad. This really is the perfect combo. I love when I can make this fresh from my own garden. It’s great over grilled salmon. Best ever! What a delicious recipe! This will be perfect when I have garden tomatoes!